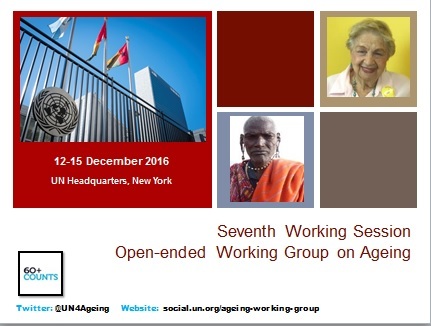 In December 2016, the UN’s Open-Ended Working Group on Ageing held its 7th Annual Session to consider how to better protect the rights of older persons. Claudia Mahler from the German Institute for Human Rights reports for ENNHRI. The UN General Assembly established The Open-Ended Working Group on Ageing (OEWG) in December 2010 to consider how to address gaps in human rights legislation, including considering developing a new Convention on the Rights of Older Persons. The Seventh Working Session of the OEWG, held in December 2016, was a truly inspirational event. While many European states have previously expressed reservations about a new Convention on the Rights of Older Persons – stating that existing binding conventions protect their rights just as effectively – several others (Austria, Germany, Slovenia, Spain and the UK) expressed a willingness to participate in an open discussion on thematic issues. This change in attitude may have been partly influenced by the 2016 annual report of the UN’s Independent Expert on the Rights of Older Persons, Ms Rosa Kornfeld-Matte, which argued that existing conventions and soft law are insufficient to ensure the full enjoyment of older persons’ human rights. Finally, and most importantly for ENNHRI and all NHRIs globally – the OEWG voted to grant full participation rights to NHRIs with an A-status and to allow them to attend in their own right. Unfortunately, the networks did not achieve the same rights, but hopefully this will follow. This was an important step for NHRIs, both practically and symbolically – NHRIs have a significant amount of expertise on the human rights of older persons and are an important link between national stakeholders and the UN system. Their presence at future OEWG-A meetings will help these international actors to understand the human rights issues facing older persons on a daily basis as they move forward in clearly delineating the human rights of older persons. A side event hosted by the Global Alliance and the Asia Pacific Forum of National Human Rights Institutions demonstrated the expertise that NHRIs have on the rights of older persons. Click here to access the Chair of the OEWG’s report. Since 1945, the United Nations has drafted and adopted nine binding human rights treaties that protect the human rights of all individuals across the globe. However, there is currently no specific international convention protecting the rights of older persons and so standards that protect older persons’ human rights are dispersed throughout the various international and regional conventions.